It is important to realize that Excel is probably the largest and most complex software application ever created. Hardly anybody understands how to use every Excel feature and, for almost all business users, large parts of Excel’s functionality wouldn’t even be useful. 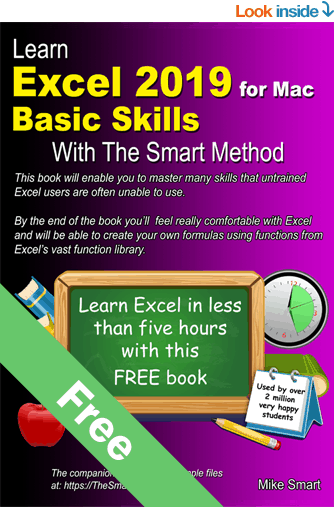 The Free Basic Skills Excel 2019 for Apple Mac Tutorial may be all you need but if you decide to further expand your Excel education you’ll be able to use the other low-cost books in this series to master even the most advanced Excel features. The free Excel 2019 Basic Skills for Apple Mac tutorial will get you started with Excel fundamentals. Even though it is a basic skills course you’ll still master many skills that professional Excel users are unable to use. It is available entirely free as an e-book. 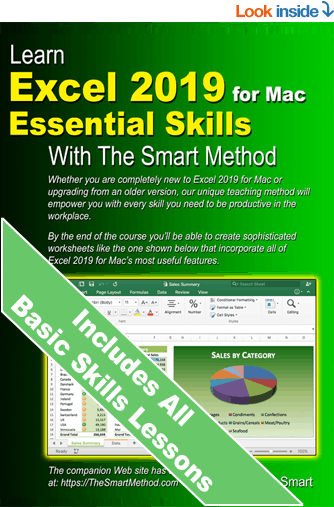 The Basic Skills course contains the first 43 lessons from the Excel 2019 for Apple Mac Essential Skills course and will take most users 5 hours or less to complete. This free e-book is also available for Excel 2016 for Apple Mac. It is also available for Excel for Windows versions: Excel 365, Excel 2019, Excel 2016, Excel 2013, Excel 2010, and Excel 2007. If you need Excel skills to get a job you should begin with this course (it also includes all of the Basic Skills material). Even if you’ve never used Excel before you’ll have no difficulty completing this course, most learners can complete it in two days or less. The Excel 2019 for Apple Mac Essential Skills course will give you all the skills an employer would expect. By the end of the Essential Skills course your Excel skills will be better than most office workers. Teaching a class? Order 5+ printed books at wholesale price. After the Essential Skills course you’ll be really, really good with Excel. If you want to join the tiny elite of power-users who can do absolutely everything with Excel you can take the Excel 2019 for Apple Mac Expert Skills course and become a true Excel guru. By the end of this course your Excel skills will be greater and broader than almost all other Excel users in the workplace. The Excel 2019 for Apple Mac Expert Skills (paper) printed book, and the e-Book are separate stand-alone products and each covers exactly the same course content. Why should you use our courses to learn Excel? You’ll need to invest a lot of your time to develop Excel skills. It is really important that you choose the very best materials to learn. Here are three good reasons why you should choose The Smart Method. Our acclaimed free Basic Skills Excel 2019 for Apple Mac Tutorial e-book is used by schools, colleges, universities and industry to train Excel fundamentals. Most students can complete this course in five hours or less. By the end of the free Excel 2019 Basic Skills book you’ll be able to create your own formulas using functions from Excel’s vast function library. You’ll also have mastered many other fundamental Excel skills such as AutoSum, AutoFill and Formula Autocomplete. For over fifteen years, Smart Method® classroom courses have been used by large corporations, government departments and the armed forces to train their employees. Each course has been constantly refined (during hundreds of classroom courses). This has made the book effective for students of all ages and abilities. We have never had a student who has failed to learn Excel after taking one of our courses. 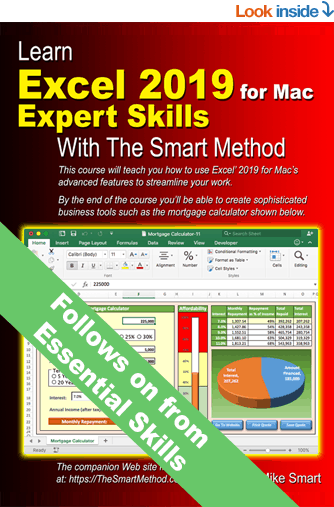 The free Basic Skills Excel 2019 for Apple Mac Tutorial may be all you need but if you decide to further expand your Excel education you’ll be able to use the other low-cost books in this series to master even the most advanced Excel features. If you need to move your Excel skills up to the next level, check out the Excel 2019 for Apple Mac Essential Skills Tutorial to see all of the skills you’ll learn to reach this high level of Excel proficiency. If you’re already an accomplished Excel user check out the Expert Skills Excel 2019 for Apple Mac Tutorial to discover advanced skills that are rarely mastered (even by Excel power users). Here are some of the companies that The Smart Method have helped empower with excellent Excel skills. Some have taken our classroom courses and others have benefited from our online resources.